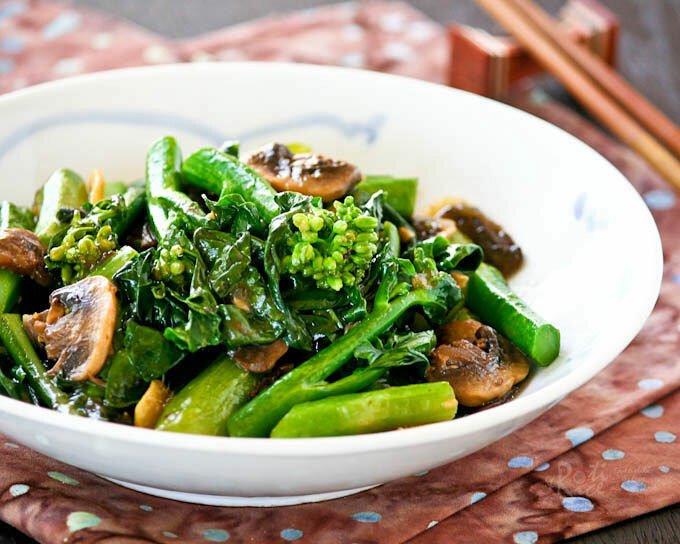 Learn the technique to cook your own tender crisp Stir Fry Gai Lan (Chinese Broccoli) with mushrooms at home. Takes only a few minutes to prepare. Gai Lan or Chinese broccoli is my all time favorite Chinese vegetable. Mom cooked it often back when I was growing up in Malaysia as it was and continues to be very easily available there. 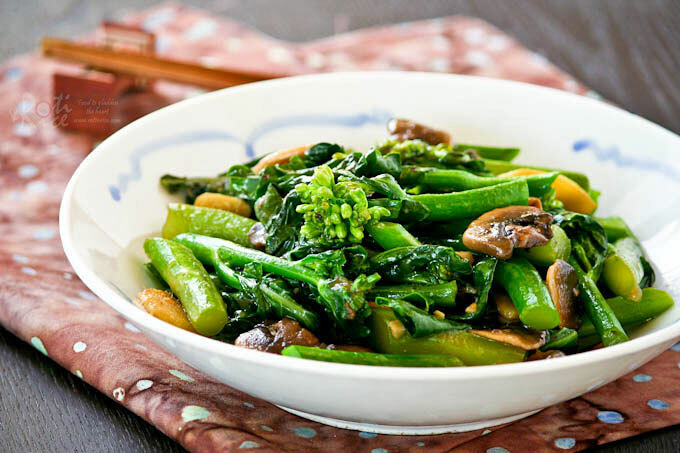 Most of the time, she would stir fry the Gai Lan with mushrooms and oyster sauce. Sometimes, she would lightly scald the entire stalks in boiling water and tossed them with a garlic soy sauce dressing similar to that found in this Steamed Tofu recipe. Both ways are equally delicious but today, I am going to show you how easily this Stir Fry Gai Lan can be prepared at home. Gai Lan is the Cantonese name for this blue-green leafy vegetable prized for its thick tender stems and flower buds. It belongs to the same species as broccoli, hence its name. Interestingly, according to this source, broccolini is a hybrid between broccoli and Gai Lan. It is no wonder they look similar. 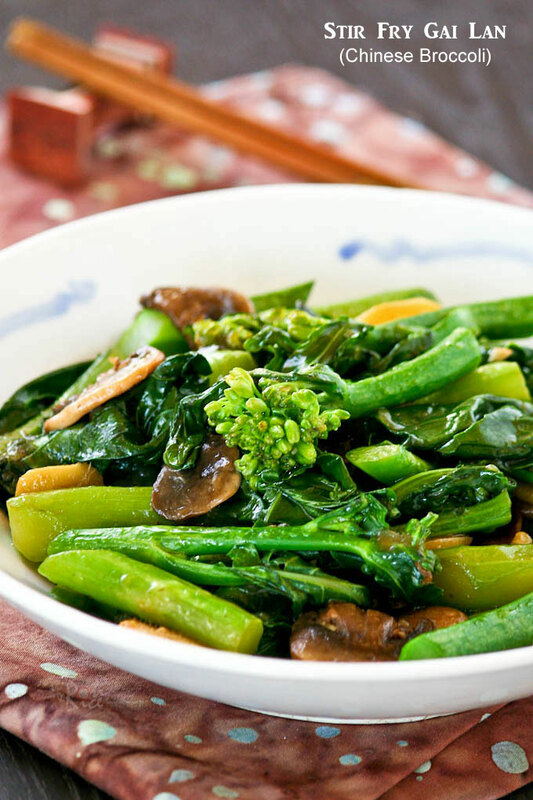 Gai Lan may be steamed, lightly boiled, or stir fried. Once cooked and toss with a little oil, it has a nice smooth glossy sheen. The taste is only very slightly bitter yet sweet. I can never get enough of this vegetable. I buy them whenever I see them. The good thing is that they are pretty easily available and is a mainstay at the Asian markets. Choose a bunch with smaller stalks and brightly colored leaves. The flower buds should be tight and compact. Open flowers mean that they are past due. The stems on these are fibrous and more bitter. Always wash and drain all leafy vegetables thoroughly before doing a stir fry. Vegetables that are not properly drained will produce a soggy stir fry. Use a salad spinner if necessary. Stems and leafy parts should preferably be separated as stems do take a slightly longer time to cook. Adding the stems to the pan first and frying them for an additional minute or two prevents the leaves (which are added just a little later) from becoming over cooked. In the recipe below, I have used regular fresh mushrooms for convenience. Please use Chinese mushrooms if you prefer. I have also omitted the oyster sauce as I no longer use it in my cooking. The taste of this Stir Fry Gai Lan is much fresher and lighter, yet equally if not more delicious. I hope you will give it a try. Wash and drain gailan thoroughly. Trim 1 inch off the end of the stalks. Cut off each leave from the stalk and then cut the leave into 2 or 3 bite size pieces at a diagonal, about 2 to 3 inches in length. Cut the top part of the remaining stalk into bite size pieces as well, leaving the remaining end of 3 to 5 inches. This woody section should be peeled with a paring knife before cutting diagonally into bite size pieces. Stems and leaves should preferably be separated. NOTE: Video was added to this post on May 7th, 2014. This stir fry looks really delicious. Looks delicious, my mom love to put soya sauce into her dishes too, she claimed it gives the dishes more flavor, but I love to add a dash of oyster sauce for even more flavor lol! Its so simple n looks yummy.I do it minus soy sauce,mushrooms n cornstarch. I use salt. I have looking for the right chinese way to cook n here it is. Thank you very much. This was perfect ! Thank you, will be adding it to my favourites. Very glad to hear that! Thank you! I’m an Alaska transplant from Hawaii. Saw and bought some gai lan from a new Asian store and crabbed it. Cooking it with tofu. Question. Is there a substitute for the Shao Hsing cooking wine? You can use a dry white wine or omit it altogether. Hello, may I ask the reason why you no longer use oyster sauce in cooking? Thanks! It is a matter of personal preference. Also I prefer the taste of soy sauce.